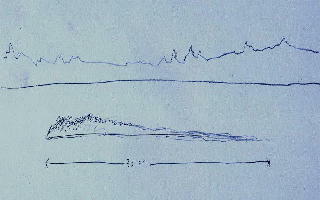 Image # 1 – A sketch by Mr Steen of the 30 foot “Something” he and another person witnessed in Glamour Lake. The Director of Cryptozoology at PSICAN requested that Mr Steen provide a sketch of the thing they saw, and a map of the lake (where they were exactly relative to the shape and lay of the local roads and the lake) and other relevant information. “the photo is the exact area that I saw something strange. (See image # 2 below) Since that time I have reflected to myself and my wife that maybe just maybe what we saw was a loon playing about. But deep down I know it not to be a loon because of the height of the wake, the length and the speed in which it appeared. As you can see from this photo there is a lot of activity on the surface and as I mentioned in an earlier email to you it is the locale of choice for jet skiers too. I wonder if the sound drew the lake monster up from the depths?. The lake itself has two dams at opposite ends of the lake and at the one end it connects to a terribly small lake known as Little Glamour lake as to the other end I am not aware as to what that body of water is called. 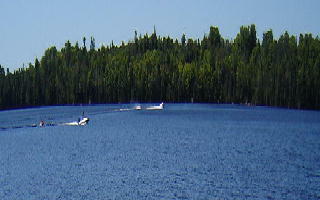 Image # 2 – A photo of the area where Mr Steen and another person witnessed a 30 foot “Something in Glamour Lake. 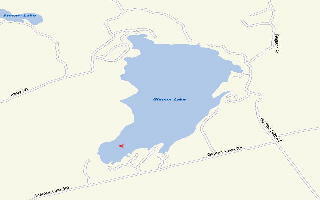 Image # 3 – A map of the area where Mr Steen and another person witnessed a 30 foot “Something” in Glamour Lake. The X on the map indicates the location of the sighting. This was the second sighting in Mr Steen’s lifetime. The first was when he was 15 years old and was canoeing at the forks of the Missinaibi river and the Albany river in Northern Ontario. The difference in this sighting to his sighting at Glamour Lake was that the creature actually rolled the surface in front of him and his dad. He then asked his dad what was that was and he replied " a sturgeon". Mr Steen has since learned that sturgeons don't roll and have spikes or thorns on their sides. Also, according to Mr Steen the texture and substance of what rolled right of the front of his canoe definitely was not a Sturgeon. In a recent telephone conversation with another resident of the Haliburton area the author was informed that she knew of two men, who had been fishing on Glamour Lake when they witnessed a very large and lengthy creature swim under their boat. These witnesses did not wish to speak of the sighting. In conclusion, it is difficult to determine, if an aquatic creature of unknown origin lives in Glamour Lake. It is only through further sightings and an onsite investigation could more conclusive evidence to the existence of a creature in Glamour Lake possibly be confirmed.